At the young age of 16, Dyer, Indiana resident Joshua DeBoer is a highschool graduate, a business partner for Tech Team 911, and now a scholarship recipient. In April, DeBoer recieved a Westwood College scholarship totaling $90,000 from school president Bruce McKenzie. His ambitions are to study Network Technologies with a major in Systems Security at the River Oaks campus in Calumet City. Growing up as a homeschooled student, DeBoer was given numerous opportunities to excel in academics, as well as many other areas of his life. He was homeschooled at the Deboer Homeschool Academy and was provided with plenty of free time that he used to form a Dyer-based emergency computer repair and service business, Tech Team 911, last year. Working with partner and IT Manager Derek Vaupel, Deboer provides onsite emergecy and non-emergency technology related services as well as networking, providing computer education, and building computers. DeBoer’s clients range from local business owners to medical educators. 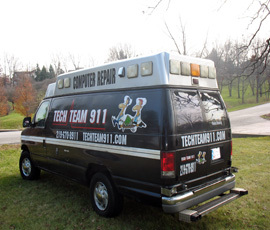 DeBoer explains that in order to “reinforce the fact that we (Tech Team 911) are available for emergency calls, my parents let me purchase the old retired White Sox ambulance last year”. Although this may sound like a crazy purchase, and indeed it isn’t an average purchase for a 16-year-old boy, DeBoer says he plans to “have the ambulance fully stocked with any computer supplies [he] might need for onsite repairs”. He hopes that this system will limit the prospect of always having to order parts. Once he receives his degree, one of DeBoer’s aspirations is to advance his business further. Which now, thanks to his $90,000 scholarship, DeBoer is well on his way to earning his degree. “I hope to expand my business further into the Chicagoland area, maybe hire more employees to run seperate locations so I can expand the range in which I offer computer services,” Deboer expresses. Time, among other things, is one of the great benefits of homeschooling. Free time and organized time developes a framework for activities and successes in a young student’s life. Homeschooling allows students to excell at their God-given talents and provides them with an uplifting, encouraging enviroment to pursue their dreams. Just as Joshua DeBoer used the time he was given to pursue and develope his talents, so we can also take charge of our time and use it to chase after our dreams (and you don’t have to just be 16 to do it)!